While I'm Waiting...: red, white & fabulous! With the 4th of July just days away, I've found myself drawn to all things red, white, and blue. 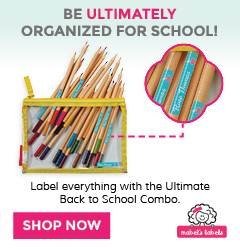 Today I'm sharing a few of my FAVORITE finds!!! 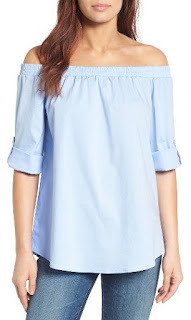 This chambray off the shoulder poplin shirt would be adorable paired with white shorts and Converse! 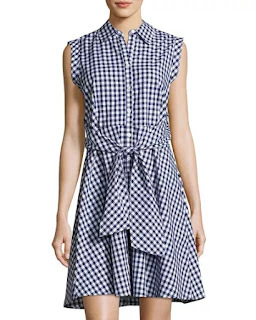 You had me at navy and white gingham!!! 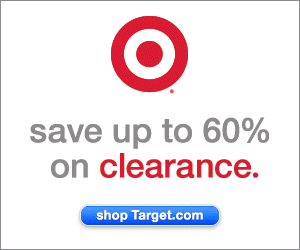 This tie-waist dress (on sale for less than $35!) would be perfect for a picnic but could also be worn for just a day at the office! So many of my favorites in one top - one shoulder, embroidery, and a scallop edge. This red top is near perfection! Looking for a fun shoe for your trip to the lake? 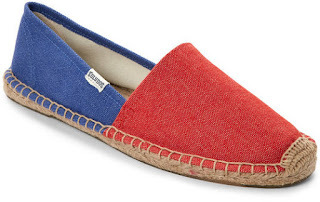 These espadrilles are just what you need! 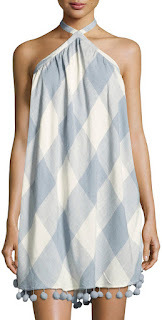 I'm definitely drawn to certain styles and this gingham halter dress was love at first sight. Love, love, love the pom details!!! 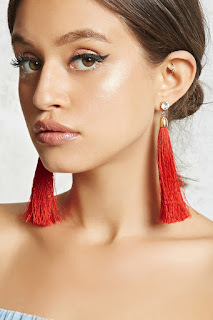 I wear the same earrings every.single.day but if I had the courage to step out, these red tassle earrings would be the perfect accessory for the 4th of July! I've been on the lookout for an appropriate (aka mom approved) length white denim mini skirt and this one just might be the one! A scarf in Texas in the summer doesn't sound functional (or comfortable) but I love the look of a silky scarf tied neatly around your neck. 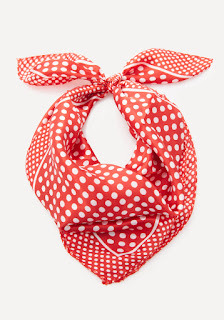 So chic and fun and polka dots!!! What does make sense in Texas summers? Great shorts, that's what! 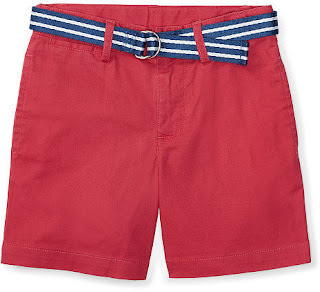 These red shorts would look adorable with a white button down or a blue and white gingham top. 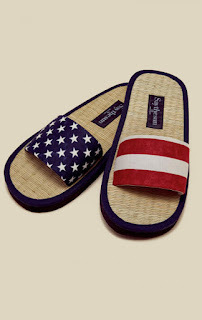 These fun American flag inspired slides would be the perfect pool shoe! I don't have anything like this gorgeous red floral kimono but that's about to change. I ordered this as soon as I saw it - crossing my fingers I can pull it off! 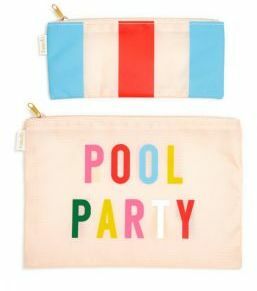 This fun pool party bag would be perfect to toss your sunnies, keys, lip gloss, and suncreen in while you are splashing around in the pool! 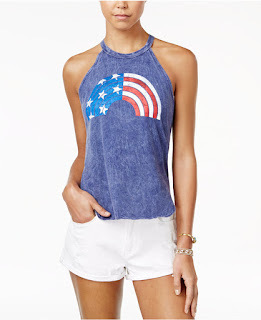 And, if you are looking for a great graphic tank, I LOVE this rainbow flag top! Happy Friday! I hope your weekend is full of all your FAVORITE things! I am obsessed with all things red, white and blue! 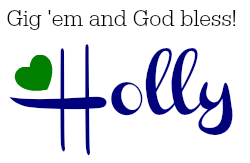 LOL Happy weekend Holly! Those are some very cute clothes . . . for someone who is much younger and slimmer than I am. I love that white and navy gingham dress! I love that navy and white gingham dress! It just screams summer! My favorite is the OTS top! It is so pretty! Um...yes please to all of this...AND to having your post again!! Great post!